Dr. Crowder specializes in school based occupational therapy with 17 years of practice experience in this setting. Previously, she worked for 3 years with primarily adult populations covering outpatient, day treatment, inpatient and skilled neuro-rehabilitation settings. 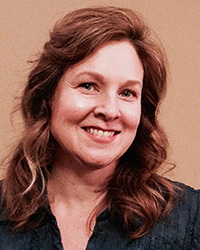 As contributing faculty for the University of St. Augustine since 2015, Dr. Crowder has re-designed and taught the School Based Practice course, co-taught the Administration and Management course, led students in self-directed studies, and directed students in completion of post professional capstone projects. Dr. Crowder participates in the Post Professional Curriculum Committee and the ongoing revision of the Capstone process. Dr. Crowder also serves as adjunct faculty for Milligan College, TN. Dr. Crowder’s research includes a grounded theory analysis of family interviews completed with an interdisciplinary team including occupational therapy, physical therapy and nutritional science, and published in Preventive Medicine in 2012. Dr. Crowder holds state licensure in Florida and Tennessee as well as certification through the National Board for Certification in Occupational Therapy. Her specialized training includes the USC/WPS Sensory Integration Certification Program and grant writing. She is an active member of the American Occupational Therapy Association.